The Canadian Environmental Assessment Agency is calling for comments on the proposed LNG project at Prince Rupert. As part of the strengthened and modernized Canadian Environmental Assessment Act, 2012 (CEAA 2012) put in place to support the government’s Responsible Resource Development Initiative, the Canadian Environmental Assessment Agency must decide whether a federal environmental assessment is required for the proposed Pacific Northwest LNG Project in British Columbia. To assist it in making its decision, the Agency is seeking comments from the public on the project and its potential effects on the environment. Progress Energy Canada Ltd. is proposing to construct and operate a liquefied natural gas (LNG) facility and marine terminal near Prince Rupert, within the District of Port Edward. 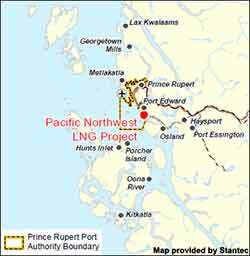 The Pacific Northwest LNG facility would be located on Lelu Island. The proposed project would convert natural gas to LNG for export to Pacific Rim markets in Asia. The agency says written comments must be submitted by March 11, 2013. The CEAA says it will post its decision on the website if a federal environmental assessment is required. If it is determined that a federal environmental assessment is required, the public will have three more opportunities to comment on this project, consistent with the transparency and public engagement elements of CEAA 2012. Projects subject to CEAA 2012 are assessed using a science-based approach. If the project is permitted to proceed to the next phase, it will continue to be subject to Canada’s strong environmental laws, rigorous enforcement and follow-up, and increased fines. By “CEAA 2012,” the agency is referring to the omnibus bill, best known as C-38, which actually weakened the CEAA’s ability to review projects. “Science-based approach” has become a stock phrase used by the government of Stephen Harper on resource issues, while it weakened environmental review procedures, terminated the jobs of hundreds of scientists and restricted those who are left in the government from speaking to the media or commenting on issue. In December,the CEAA called for similar input for the Coastal GasLink project to Kitimat, with a deadline of January 30. No decision has been announced for that project. which would be built by TransCanada for the Shell LNG Canada project. The future of the Northern Gateway project is now completely in the hands of Prime Minister Stephen Harper’s cabinet. Today, Friday, August 3, 2012, Environment Minister Peter Kent used the provisions of what the Harper government calls the Jobs, Growth and Long Term Prosperity Act (former Bill C-38) to set a final deadline for a report from the Northern Gateway Joint Review Panel on December 31, 2013 and reserve the final environmental decision for the Governor-in-Council. Today’s move, in effect, is the final gutting of the Joint Review Process, making it irrelevant, since, as long suspected, the government will now make the decision on its own. The Joint Review Panel no longer has the power to reject the Northern Gateway on environmental grounds, that is now solely up to the Harper cabinet. Once the Gateway project is approved, as expected, the NEB has been ordered to issue the approval certificate within seven days. By releasing the news on a Friday afternoon before a holiday weekend, the Harper government spin doctors through Environment Minister Peter Kent have also pulled the classic government move of releasing bad news when it will least be noticed. The Governor in Council will make the decision on the environmental assessment (whether the project is likely to cause significant adverse environmental effects and if, so whether such effects are justified in the circumstances). The Governor in Council will decide, by order, whether the board should issue a certificate and will give reasons for the order. Under the act, the NEB now has to file its environmental assessments within 543 days of the act coming into force, hence the imposed deadline. If there are no excluded periods this would mean that the environmental assessment and report must be submitted no later than Dec. 31, 2013. If the Project is approved by the Governor in Council, the NEB will issue the certificate of public convenience and necessity within seven days of the Governor in Council’s order. That’s a clear indication that the Harper government still intends at this point to fast track the Northern Gateway project. Apart from giving the most environment unfriendly cabinet in Canadian history the decision power, most of the memorandum of agreement are legalistic changes necessary to bring the former agreement into compliance with the new law. any change that the project may cause in the environment, including any change it may cause in listed wildlife species as critical habitat or residences of that species…. While this may be simply legalistic language, given the overall tone of the Harper government’s policy, especially the changes in the Fisheries Act that only protects fish habitat when it affects commercial species, one has to wonder if the emphasis on listed (that is threatened or endangered) species is again a narrowing of the criterion for approving the pipeline. The second phrase is also ambiguous, seemingly to imply that the environment could be to blame for any problems the project may face. Opponents have long pointed out that the environmental conditions and risks such as geologic instability along the pipeline route and the heavy weather in the waters off British Columbia are factors that increase the danger of an oil spill event whether on land or sea. However, the new agreement presents an almost Orwellian scenario that would blame the environment, an “Act of God” in insurance terms, rather than the company or the government for any future disaster. The main phrase in the agreement “whether such effects are justified in the circumstances” clearly indicates that the Harper government is fully prepared to ignore the environmental fallout of the Northern Gateway project and so the stage is set for a much wider political battle. Tiny amounts of copper in a river affect a salmon’s sense of smell, making it harder to avoid predators, according to a study at Washington State University. Jenifer McIntyre says the copper means that a salmon can’t detect another compound that ordinarily alerts them to be still and wary. The minute amounts of copper can come from mines and even the brake linings of cars. “A copper-exposed fish is not getting the information it needs to make good decisions,” says McIntyre, a postdoctoral research associate in WSU’s Puyallup Research and Extension Center, whose study built on earlier work that showed that copper can affect a salmon’s sense of smell and thus changing its behavour. McIntyre put the two together, exposing juvenile coho salmon to varying amounts of copper and placing them in tanks with cutthroat trout, a common predator. Healthy salmon can smell compounds in the water that are released when another fish is damaged. That substance, called Schreckstoff, German meaning “scary stuff,” alerts fish to nearby predators. In her experiments, conducted in a four-foot-diameter tank, fish that weren’t exposed to copper would freeze in the presence of Schreckstoff, making it harder for motion-sensitive predators to detect them. On average, half a minute would go by before they were attacked. But salmon in water with just five parts of copper per billion failed to detect the Schreckstoff and kept swimming. They were attacked in about five seconds. The unwary exposed fish were also more likely to be killed in the attack, being captured 30 percent of the time on the first strike. Unexposed fish managed to escape the first strike nearly nine times out of ten, most likely because they were already wary and poised to take evasive action. McIntyre also noticed that the behavior of predators was the same whether or not they had been exposed to copper. Copper finds its way into streams and marine waters from a variety of sources, including motor vehicle brake linings, pesticides, building materials and protective boat coatings. Actual amounts will vary from undetectable in rural or forested areas to elevated in urban areas, especially when runoff from a storm washes roads of accumulated brake dust and other contaminants. With testimony from McIntyre’s NOAA colleagues and others, the Washington State legislature in 2010 started phasing out copper brake pads and linings over the next 15 to 20 years. According to the state Department of Ecology, brake pads are the source of up to half the copper in the state’s urban waterways. McIntyre used concentrations of between 5 and 20 parts per billion but has sampled highway runoff with 60 times as much copper. Copper’s effect is mediated by organic matter, which can make the metal unavailable to living things. “My scenarios are potentially more like a hard-rock copper mining situation than storm water runoff, which typically carries dissolved organic matter along with the copper and other contaminants,” McIntyre says. A number of large copper mining projects are proposed for the northwest region including, the controversial Taseko’s Prosperity copper mine near Williams Lake which was stopped after the local First Nations and environmental groups opposed the use of one lake for a tailings pond. Taseko is now trying to revive the project. There area also a number of copper mine proposals for the both the northwest BC coast and the Sacred Headwaters region, source of the major salmon rivers, the Skeena, Nass and Stikine. There is also a proposed copper mine Pebble Mine, at Bristol Bay, Alaska, another prime area for sockeye salmon. Environmental impact of the Canadian copper mine projects are likely to be affected by the provisions of Bill C-38 which speed up environmental assessment and essentially gut habitat protection for fisheries. Her research, conducted for a University of Washington doctorate with colleagues at UW and the National Oceanic and Atmospheric Administration, appears in the latest issue of the journal Ecological Applications.